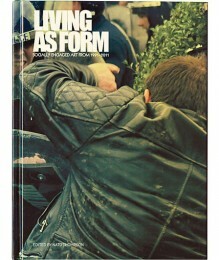 Living as Form is an important volume for anyone interested in understanding the complexities of socially engaged art. The volume accompanies an exhibition of the same name held in Essex Street Market, Manhattan, curated by Nato Thompson and co-authored by Creative Time—a New York-based non-profit arts organization—and Independent Curators International, NY. Thompson gathers together over one hundred projects in a collection of socially engaged art spanning twenty years. Although this is not an exhaustive compendium, it is a valuable sourcebook for anyone wishing to see what socially engaged art “does.” Thompson consulted twenty-five advising curators in preparation for the exhibition and the book, which is demonstrative of the collective nature of projects such as this. Whilst presenting a plethora of artists and artists’/community groups’ projects, the volume also collects together seven essays from key commentators on socially-engaged art: Nato Thompson (editor, Chief Curator at Creative Time, Seeing Power: Socially Engaged Art in the Age of Cultural Production), Claire Bishop (Participation, Artificial Hells), Maria Lind (Director of the Tensta Konsthall, independent curator and critic), Teddy Cruz (political architect, Estudio Teddy Cruz), Carol Becker (Thinking in Place), Brian Holmes (Unleashing the Collective Phantoms, Continental Drift) and Shannon Jackson (Social Works). Although these authors have the subject of socially engaged art in common, their approaches and methods are diverse—from activism and architecture through to curating and theatre—which aptly reflects the heterogeneous worlds in which socially engaged art manifests. Thompson’s introductory essay to the volume is articulate and thought-provoking. The opening begins by re-visiting old ground—the familiar rhetoric surrounding collective, socially-engaged art and relational aesthetics—such as the 2001 Women on Waves project (featured in Claire Bishop’s canonical Artforum essay “The Social Turn: Collaboration and its Discontents”), the diverse terminology and types of practice (as cited in Maria Lind’s “The Collaborative Turn”) and the common avoidance of the question “is it art?” However, it soon becomes apparent that, in a volume such as this, the ground needs to be fertilized in order for Thompson to present his own approach; an approach that draws upon art historical references without tying these new practices to a particular lineage or legacy. Instead, Thompson shows us how unimportant categorization is to a social practice that has now traversed the art-life boundary. The question is no longer “is it art?” but “what is life?” (33). However, this new practice is rooted in and yet distinct from the twentieth century avant-gardist adage of the return of art to life praxis. The projects discussed in this volume cannot be articulated in terms of the everyday aesthetic; they are the everyday. Thompson shifts the focus from the aesthetic to the methodologies adopted by socially engaged artists. He also emphasizes the spatial component of new artistic practices that move out of the gallery and, quite literally, onto the streets. These acts play with the cultural symbolism of a society now thoroughly ensconced in the spectacle. Perhaps play is not the correct term; serious issues ranging from the political and the social to the cultural and the geographical are the subject and object of these formless acts. Because the spectacle is embedded in contemporary society—fulfilling Debord’s perhaps premature accolade “the society of the spectacle”—the symbolic becomes the real and the real is what socially engaged art takes as its material. Part II changes pace. The priorities of art are now changed and this is routed in the social, which Thompson argues is symptomatic of cultural production at the beginning of the 21st century. He begins to contextualize this change with a focus on what Thompson terms “spectacular living” (29). In the past twenty years, there have been profound changes within society including the growth of the creative industries and the emphasis placed on symbolic forms adopted by the media and the advertising world. Thompson argues that this all-encompassing focus on the spectacular has affected the way in which artists and activists respond to the world. Symbolic forms become important to the media and artists, activists and cultural producers alike. Acknowledging the new position of the symbolic helps us to understand the forms of resistance to that power from artists, activists and engaged citizens. Whilst contextualizing social practice, Thompson contributes one of the most articulate distinctions between “relational aesthetics” (Bourriaud) and socially engaged practices—a familiar debate, and one that is returned to within this volume. He distinguishes between relational artworks and socially engaged projects in terms of space and time; relational art is a short-term investment—a temporary project that adopts the symbolism of activism—whereas socially engaged works adopt the “strategic turn” of a long-term investment in space. The strategic turn is local, long-term and community-based (31). The practices in this volume espouse the “strategic turn” rather than making a short-term investment in gallery space. Thompson concludes his essay by re-emphasizing the conception that socially engaged art produces effects and affects instead of placing a focus on form. This idea is key to opening our minds to socially engaged works; one must move away from the modernist focus on form that has dominated twentieth century art historical discourse and turn to concepts that help us understand today’s artistic production. Claire Bishop’s essay elaborates the discussion of the “spectacle.” Whilst acknowledging that it is a key word in analyses of socially engaged art, she notes that the term is rarely used in the Debordian sense, which refers to social relations under capitalism. These social relations, we recall, are mediated by images. Bishop recounts Boris Groys’ updated notion for the information age—the “spectacle without spectators”—and argues that participatory art “forecloses the traditional idea of spectatorship and suggests a new understanding of art without audiences, one in which everyone is a producer” (36). But what are the historical conditions of this new phase of artistic production? For Bishop these are twofold. On the one hand, there are the practices that are born out of the legacy of the historical avant-garde; on the other, there are those that emerge out of the 1960s’ legacy. The former adopts constructivist gestures of social impact, proposing an alternative to an unjust world, the collective production of which is affirmative. The latter adopts a nihilist redoubling of alienation that negates the world’s injustice and illogicality on its own terms. In this case, the collective production is indirect, what Bishop conceives of as the “negation of negation” (36): the Situationist International’s “dérive,” for example. Bishop utilizes Luc Boltanski and Eve Chiapello’s critique of capitalism as a way of articulating the tension between two different interpretations of participatory art. However, Bishop’s is not a direct reading of their analysis. She understands the two modes of critique to be in tension with one another when, in fact, Boltanski and Chiapello state that it is the four sources of indignation on which the critiques are based that can be at odds with one another, thus creating an apparent incoherence or tension (Boltanski and Chiapello 38). Boltanski and Chiapello propose that each mode of critique comes to the foreground within distinct phases of capitalism; for example, the social critique within the 1930s and the artist critique post-1968. Around the 1990s, they claim, capitalism co-opts the terms of the artist critique, creating a society in which the ideological traits associated with a certain conception of artist becomes a model for management and work (flexibility, individuality, creativity, etc.). A constant tension is not necessarily fostered between the critiques, as Bishop suggests; rather, the types of critique target the negative aspects of capitalism within the respective periods. Therefore, as the artist critique gets absorbed into neoliberal ideology, Boltanski and Chiapello argue that the social critique begins to be revived. Bishop suggests that participatory art gains prominence during periods of social and political change. These are generally the periods in which the mode of critique transmutes. Ultimately, from a Rancièrian perspective, Bishop argues that a tension should be maintained between the social and artistic critiques. It is the binary tensions within the historical analyses of participatory art that perpetuates it (i.e. spectacle/participant, individual/collective). Moreover, she states that art alone is not equipped to effect social change; however, the historical avant-garde’s proximity to political parties provides a model upon which to build. In a final rallying cry, Bishop calls for the realignment of the negation found in new modes of art with left-wing political movements in furtherance of better equipping artists engaged in devising new models of social and political organization. Maria Lind’s contribution to the volume takes a more reflexive turn. She draws upon her own experience as a curator of socially engaged art and addresses the need for it to escape the traditional art institution. As such, she introduces some important early examples of this practice, such as Elin Wikström’s Returnity—upon which the title of the essay is based—which involved members of the public cycling backwards in Münster, Germany during the summer of 1997. Lind pragmatically acknowledges the reservations held about social practice, namely temporality and the limitations on direct feedback. However, she remains optimistic that social practice can still “offer the possibility of avoiding preconceptions about art production and direction,” she adds, “if only for a moment” (55). Teddy Cruz’s essay focuses upon the political role of art and architecture in the US post-2008. Against a changing social and economic backdrop, Cruz stresses the need for art and architecture to address the social (rather than focus on the formal and the aesthetic—a recurrent theme in these essays). He begins by identifying three “slaps in the face” to the American public since 2008: first, the bank bailout; second, the foreclosures and rising unemployment; and, third, cuts to social programs and other austerity measures (58). Cruz argues that the current period is socially and politically distinct from the post-depression years because an “elite” minority now holds the majority of US wealth. Moreover, the contemporary crisis is not predominantly economic or environmental; it is a cultural crisis with a dwindling “public” at its heart. Therefore, a more functional relationship between art, architecture and the everyday is called for in order to restore the critical bridge between the public and the cultural institution (now under the power of the “elite”). This bridging, in turn, is important to rebuilding an alternative idea of the public within a neoliberal world. As Thompson articulates in his opening essay, the “praxis” of the everyday is, once again, emphasized over its “image” (62). Cruz offers two possible solutions within art and architecture. First, the call for artists to foster a “radical” or “critical proximity” to the institution and to become interlocutors between art and the everyday, “mediating new forms of acting and living” (58-59). Second, Cruz pinpoints examples of “communities of practice” within immigrant communities in the US that demonstrate an “informal urbanization” (63). These communities are not reliant on top-down neoliberal models but rather engage in bottom-up culture in order to foster the utilization of space based around a new idea of community and born out of specific social conditions. For Cruz, the motivation for change lies in pedagogy—in the knowledge gained from practices that exist outside of a neoliberal model and also in understanding the origins and the nature of the socio-political condition in which we live. Through combining institutions with an “ethical” knowledge of community and artists, new knowledge corridors can be produced between the visible and the invisible. Whilst Cruz acknowledges a “shrinking relevancy of the public” (57), Carol Becker revisits the question of the public and the private proposing that the two have become hopelessly blurred. She further argues that the private has colonized the public. Becker identifies a microutopian moment in which the two converge in the events that took place in Tahrir Square, Egypt in early 2011. The protest was organized by means of mobile phones and social networking; however, the physical event occurred in public space, thus utilizing both private and public space. The underlying question is whether local space is lost in a globalized world. The images of Tahrir Square were rapidly disseminated across the globe, allowing the world to follow the events blow-by-blow. Becker stresses the need for public space to be utilized as a place for the public to gather in defense of yet another colonization by private interests. In this analysis, the museum becomes exemplary of public space that masquerades as private. Becker cites numerous examples of artists who have engaged a public within the gallery or museum space, but why do artists have this responsibility? Like Cruz, Becker argues “Artists are uniquely positioned to respond to societal transformation and to educate communities about its complexity and implications” (67). Moreover, artists gravitate to what is missing. Today, she suggests, what is missing is a public discourse about the relationship of individuals to society. Microutopic communities are one way in which artists respond to the contradictions between the public and private. Becker references Marina Abramovic’s The Artist is Present (2010) performance at MoMA as an example. In this piece Abramovic invited visitors to sit in front of her for as long as they wished to – creating a private encounter within a public setting. However, this act is distinct from those predominantly discussed in the volume as it remains within institutional space with little (external) political engagement or affect. The gallery acts, in many ways, as the neutralizing space of a potentially uncomfortable encounter in the “real” world. Becker proposes that Abramovic created a microutopian moment; however, there is a vast difference between this and the microutopian moment in Tahrir Square that she cites in the opening to her essay. Arguably, The Artist is Present, in this instance, lies with the relational works from which the socially engaged art in this volume is distinguished. Becker’s reasoning lies in the notion that utopian thinking is always communal and is fostered in the collective. In this interpretation, the coming together of Abramovic and her audience is utopic. However, the specter of relational aesthetics cannot be exorcised from this deduction. We recall Thompson’s distinction between relational works and socially engaged art from the opening essay. Relational art is the “art of the encounter” (Bourriaud), a short-term investment in space, whilst the latter creates a long-term, lasting investment in the community. The subsequent discussion of Ramírez Jonas’ The Key to the City (2010)—in which Jonas-designed keys that would unlock twenty-plus sites in New York City were bestowed to esteemed and also everyday citizens—provides a more fitting piece for the volume and in illustrating the public/private dichotomy. Ultimately, Becker’s analysis takes an, at times, uncritical (some may read romantic) view of the possibilities of art in challenging the division between public and private space. However, she does not deny the potential of art. She states that art is “dreaming a world into being” (68), that is, if anyone can sleep. Drawing upon his involvement with social movements, Brian Holmes coins the term “eventwork” to describe an avant-garde artistic practice that does not turn to modernist ideals as its model. Why do we need an alternative? Holmes proposes that avant-garde proclamations of “art into life” or “theory into revolution” are too simplistic for a consideration of new social art. Taking up a Boltanski and Chiapello-ian argument, he argues that society tended to absorb the transformations and inventions of a post-1968 re-politicized social agenda (73). Holmes states: “The question is how to change the forms in which we are living” (73). Therefore, in an argument not dissimilar to Thompson’s, art must move away from a focus on form and the aesthetic to an inter-disciplinary practice that draws on a fourfold matrix of eventwork: first, critical research; second, participatory art; third, networked communications and strategies of mass-media penetration; and fourth, self-organization or collaborative coordination. These are not linear categories but aspects that are drawn upon in different quantities and in different ways in order to change the forms in which we are living. Drawing upon this matrix, art should no be made for the gallery or the museum but should contribute towards social change. But these categories do not exist in the same space at the same time; they are there to be drawn upon as and when required in differing combinations and quantities. Despite the capitalist absorption of post-68 ideas, Holmes historicizes his new “eventwork” as rooted in 1968 which, in turn, moves through what he identifies as an expanded post-Fordist realm of activism. The expanded realm evolves from dissatisfaction within specific disciplines contributing towards critique from within. The dissatisfaction led to an insular form of critique, that is, a response to the worker’s own alienation. The paradox of eventwork is that it begins within the disciplines that it seeks to overcome (75). But this is not simply a case of a revived institutional critique (as originated in the 1960s), as some believe relational art to be. Relational art or the “radical chic of critical theory” (here both are considered to be modernist disciplines) are, according to Holmes, the result of a failed cultural critique (75). Without downplaying the importance of institutional critique within its own historical circumstances, eventwork extends beyond the politics of the institution and becomes a political act in itself. In the final essay of the volume, Shannon Jackson turns to the 1930s to remind us that art had a social role to play in the last American Depression. The Works Progress Administration (WPA) held an important position in reimagining the social order and, despite the accusations of corruption and dubious political motivations from the top, contributed to the rebuilding of society. There are lessons to be learned from returning to consider the social role of the WPA. The main lesson from Jackson’s contribution to the volume lies in her encouragement for us to acknowledge the disparate sources in which socially engaged practices are rooted and manifest. Jackson suggests that we can learn from previous periods in which art has taken on a heterogeneous social role, to develop a tolerance for mixing art forms. Here, the notion of living supersedes the visual or the aesthetic, which echoes the dominant line of the diverse approaches to socially engaged work in this volume. Rather than judge these practices from one position (albeit a socially-engaged artist or a theatrical perspective), one might consider the broader picture—the community in which the work took place, the background of the artists, the many disciplines from which the project is formed—rather than adopt a modernist form of categorization. Living as Form avoids projecting a dominant narrative or voice, allowing for a conversation to emerge amongst the “speakers” and, in the second half of the volume, the projects themselves. While this is, for the main part, a redeeming feature for a book presented in the midst of emergent narratives of participatory art; it may also be considered to be its downfall by those looking to the volume for solid answers to the question “what is socially-engaged art?” A question that, we learn, has no definitive answer. Naturally, there are concurrent tropes and ideas across the essays and the projects—the recurrent questioning of the avant-garde “art into life” adage; the escape from modernist notions of form; space, place and urban interventions and perhaps, more specifically, the role of the institutional space within these practices that take place in the wider public realm; establishing a position against the common relational works and a consideration of the political climate. And there are also those ideas on which they diverge—the role of the museum; the terminology used to discuss socially engaged art and where to draw the line between participatory and performative acts. This diversity is what makes the volume distinct from its predecessors. A miscellany of projects, from Pedro Reyes’ Palas por Pistolas (Pistols into Spades) and the forming of an Art Workers Council, through to protests such as Suzanne Lacy’s The Roof is on Fire and attempts to literally move mountains (Francis Alÿs) work alongside the essays to illustrate the myriad ideas emerging out of them. Thompson makes no apologies for the incompleteness of the list of projects included; once again, the reader is reminded that this book is meant as a conversation-starter. True to its word, Living as Form instigates a conversation with seven inter-disciplinary voices (and over one hundred community/artists’ projects) challenging the dominant discourse of art history and changing the terms in which it is spoken. Bishop, Claire. “The Social Turn: Collaboration and its Discontents.” Artforum 44.6 (2006): 178-183. Print. Boltanski, Luc and Eve Chiapello. The New Spirit of Capitalism. London: Verso, 2005. Print. Bourriaud, Nicolas. Relational Aesthetics. Dijon: Les presses du réel, 2002. Print. Lind, Maria. “The Collaborative Turn.” Taking the Matter into Common Hands: On Contemporary Art and Collaborative Practices. Eds. Johanna Billing et al. London: Black Dog, 2007. 15-31. Print. Dr. Danielle Child is an Associate Lecturer in the School of Art, Manchester Metropolitan University, UK. She received her BA and MA in History of Art and her PhD from the University of Leeds, UK. Her 2011 PhD thesis is titled: Socialised Labour under Change: Collaboration, Contracted Labour and Collective Modes of Production in Art since the 1960s." Danielle is currently working on publications that examine the relationship between art-activism and neoliberalism.